Chili bean sauce, a condiment made of capsicum, salt, and soybeans is used in this sumptuous dish. If it's not available, chili sauce can be substituted, but the flavor is not as full. This shrimp has a wonderful balance of salty, sweet, peppery, and hot flavors and is an excellent appetizer served at room temperature. 1. In a large bowl combine the salt with 3 cups cold water. Add the shrimp and let soak 1 hour. Drain the shrimp and set on several sheets of paper towels. With more paper towels, pat the shrimp dry. In a small bowl combine the soy sauce, chili bean sauce, and sugar. 2. Heat a flat-bottomed wok over high heat until a bead of water vaporizes within 1 to 2 seconds of contact. 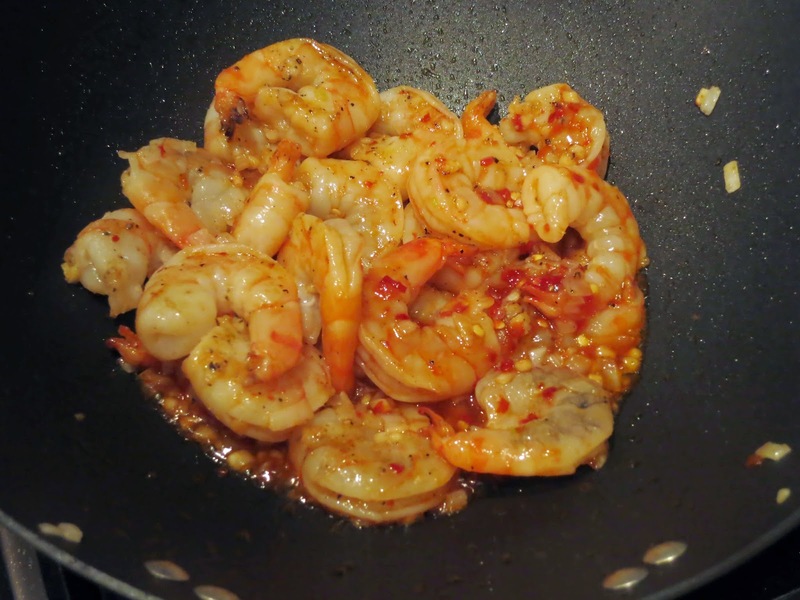 Swirl in 2 tablespoons of the oil, add the shrimp, and stir-fry 1 minute or until the shrimp begin to turn pink. Swirl in the rice wine and immediately remove the wok from the heat. 3. Transfer to a plate. Swirl the remaining 1 tablespoon oil into the wok over high heat, add the ginger, scallions, and chilies, and stir-fry 5 seconds. Stir the soy sauce mixture and swirl it into the wok. 4. Return the shrimp to the wok and stir-fry 30 seconds to 1 minute or until the shrimp are just cooked. Garnish with the cilantro sprigs.